Acclaimed Japanese artist Yayoi Kusama, a.k.a. the "Princess of Polka Dots," has been a figure in the art world since the 1940s. Her extensive body of work covers everything from writing, painting, collage, and sculpture to large-scale environmental installations and performance art. Kusama's work of art consists of turning a minimalist form of polka dots into her own motto. It is an honest obsession that comes in all colors, shapes, volumes, and patterns linking to a metaphor of life. Kusama's works swing into 3D universes, almost surreal, symbolizing the infiniteness they stand for. 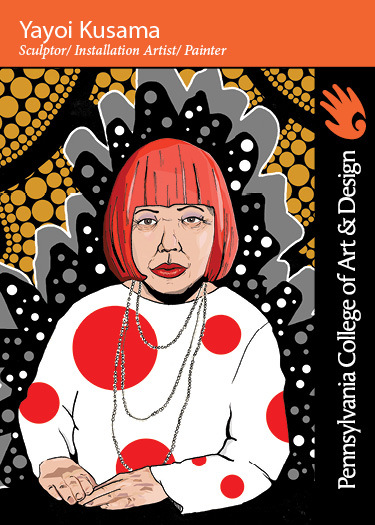 Today, at 83 years old, Kusama remains working in New York City where she has worked throughout her long and intensive career as an artist. Her pieces are a reflection of the powerful hallucinatory manner in which she views the world. One of the most important living artists to come out of Japan. She moved to the United States in 1957 and settled in New York City. Became a fixture of the New York avant-garde. First gained recognition when she organized a series of “happenings” in which naked participants were painted with brightly colored polka dots.